ASPECTS OF THE CHABAD IDEAL, THROUGH THE LENS OF HISTORY. New Book! "Journey to Barditchev"
Marking the passage of two hundred years since the journey of the Alter Rebbe, Rabbi Schneur Zalman, author of the Tanya and the Shulchan Aruch, to Barditchev in the year 5570 , and marking two hundred and fifty years since the passing of the Baal Shem Tov - one of the aims of the said journey being to pray at his gravesite in Mezubush - a Hebrew language book has been published describing that journey. New! "History of Chabad in Czarist Russia – Selected Chapters – 1770-1920"
The Chabad-Lubavitch publishing house, Kehot Publication Society, has announced the publication of an important new book on the history of Chabad. The Hebrew volume: "History of Chabad in Czarist Russia – Selected Chapters – 1770-1920," was compiled by Chabad historian Rabbi Shalom Dovber Levine, director of the Central Chabad-Lubavitch Library and Archive Center. The following is a free translation of a letter by Reb Elyeh Chaim Althoiz to the Friedike Rebbe [Rabbi Yosef Yitzchak Shneersohn] describing the tremendous impression made by Rabbi Menachem Mendel Schneerson [son-in-law and later successor of Rabbi Yosef Yitzchak] on all the Chassidim who gathered at the Rebbe's court in Riga for the festivities of Simchas Torah, while the Rebbe was absent on a visit to the united states. Though I have not yet returned to my full strength after the strain of the last two days of Yom Tov [Shmini Atzeres and Simachas Torah], and from all the dancing I am still shattered, there is not a whole limb in my body… I am unable to withhold the good, the gratification and true pleasure from the Rebbe [Rabbi Yosef Yitzchak Schneersohn], who is beloved and dear, for even one moment. 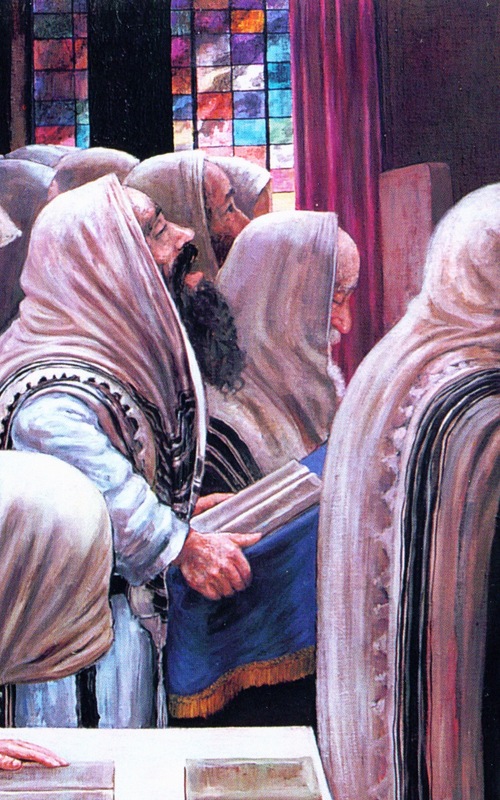 I must give satisfaction at the earliest opportunity, while I still stand in a state of great feeling of joy and pleasure; that I merited to see the rising glory of the Rebbe’s household with my own eyes, exalted in spirituality and holiness, may we only merit that it should not cease till the coming of the redeemer. As the subtitle of the book informs us, this volume contains the letters of the sixth Rebbe of the Chabad chasidic dynasty, Rabbi Yosef Yitzchok Schneersohn, to his son-in-law and eventual successor, Rabbi Menachem Mendel Schneerson, and to his daughter Rebbitzen Chaya Mushkah Schneerson. Significantly, the volume also includes relevant extracts from Rabbi Menachem Mendel’s letters to his father-in-law. While it has been published as the fifteenth volume in a series it should in truth be viewed as an independent book, worthy of singular attention and an identity of its own. 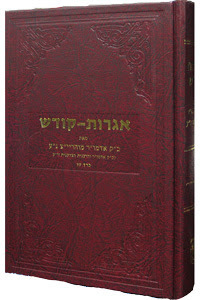 Other volumes in the series have collected a wide variety of letters, addressed to many different personalities and representing a very colorful tapestry of the R. Yosef Yitzchak’s activities and interests as well as a virtual treasure trove of historical narrative and anecdotal insight into the idealistic past of the Chassidic movement. This, however, is the first in the series to focus entirely on a single theme. These letters tell the story of Rabbi Yosef Yitzchak’s private relationship with the individual upon whose shoulders his hopes and dreams for Jews and Judaism would be carried into the future. Perhaps herein lays a crucial key with which to decipher the journey of the Chabad dynasty, and the broader path of the Chabad movement, through the uncertainties of the twentieth century and into modernity. From a letter by Reb Elyeh Chaim Althoiz to the Friediker Rebbe, Rabbi Yosef Yitzchak Schneersohn (Rayatz), who was visiting the United Sates of America at the time. As is described in the present letter, the Rebbe's family and the chassidim who he left behind were distraught at the prospect of Tishrei without the Rebbe. 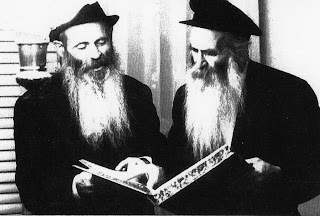 They were, however, consoled by the presence of the Rebbe's son-in-law and successor, Rabbi Menachem Mendel Schneerson. Free Translation. The Yom Kippur service finished later this year in the Rebbe's minyan than ever before, for the Rebbe's son-in-law [Ramash, Rabbi Menachem Mendel Schneerson] became totally absorbed in his prayers and oblivious to anything else during Neilah. A nice while passed before he managed to climb out of his reverie. All of us were filled with pleasure from this very pleasing wait. And as is well known, after Neilah the enthusiasm and ability of every Jewish soul to serve G-d is renewed like the strength of a young eagle. Delivered at the National Jewish Retreat 2009. In honor of the 15th of Elul, the day on which Yeshivas Toimchei Temimim Lubavitch was founded in 5657  we continue with the memoirs of Reb Nochum Shmaryahu Sussonkin, in which he describes his arrival in Lubavitch to study in ישיבת תומכי תמימים. This is the third installment. The first two, in which he describes his youth in Prepoisk and his studies in the Yeshiva of Reb Elchonon Bunim Vasserman הי"ד, can be found here and here, respectively. I finished learning in the Yeshivas for younger students at the end of the winter of 5665 . At that time the most famous Yeshivas for older students in the world were Telz, Volozhin, Slobodka, Mir, Radin and Lubavitch. I stood on a cross roads and did not know where to turn. 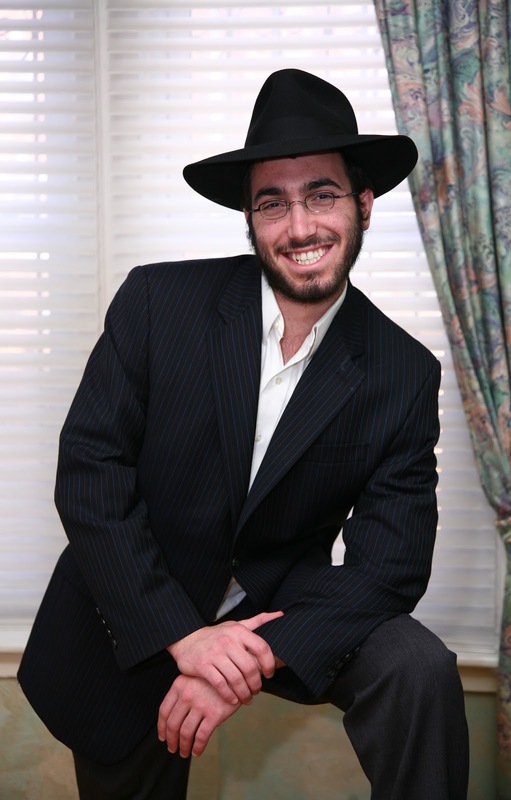 Though I had studied in Krementchug, a city of Chassidim, I had not had much contact with them and knew nothing of Chassidus, especialy not Chabad Chassidus. I had met with students who had come from Telz, Volozhin etc and though I knew that not all the students in those Yeshivas were alike, I decided that I would not go to those Yeshivas for I knew too that the spirit of the [secular movement of] enlightenment had already permeated their study halls and was afraid for my soul lest I too be smitten. A so-called 'biography' of the Rebbe, Rabbi Menachem Mendel Schneersohn has stirred much controversy and debate as to how committed he actually was to Chabad and the Chassidic (or even Orthodox) way of life. Much ink has already been spilled (most extensively at The Seforim Blog) in which the 'scholarship' of the author's is unmasked as being at the very best extremely lacking, and more probably, deliberately misleading. I do not intend to reiterate or add to the numerous examples of blatant falsification, nor do I intend to attack their central thesis directly. My intention here is simply to provide some context, lending perspective and better allowing the reader to appreciate the story of the Rebbe's life, who he was and what he did. A discussion in the comments to the previous post, "Chassidus & Chakira", highlighted the unfortunate fact that way Chassidus should ideally be viewed and properly taught, does not always coincide with the actual presentation of Chassidus in the "Chabad" educational "system" of today. The specific issue under discussion was whether or not it is the "official Chabad doctrine" to study works of Chakira. 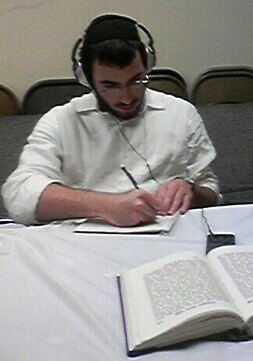 This past week I have been reviewing the Shar Hayichud of Choves Ha'Levoves. Though the polemical discussion of Creationist theory is a topic that lies essentially beyond the parameters of Chassidus, belonging rather to the realm of Chakira, Jewish Philosophical Doctrine (a discipline that is complementary to but distinct from Chassidus), I will nevertheless take the opportunity to summarize the arguments presented therein (perokim 5-6). In Chassidus this Choves Ha'Levovos is cited tens if not hundreds of times, as the principle that אין דבר עושה את עצמו - "no being can create itself". This letter was written in Tammuz 5688  less than a year following the Rebbe's release from soviet imprisonment and exile. At the time the Rebbe was living in Riga, Latvia. Note: The 12th of Tammuz is the anniversary of the liberation of the sixth Lubavitcher Rebbe, Rabbi Yosef Yitzchak Schneersohn from his exile in Soviet Russia in 1927. The Rebbe was arrested in June of that year by agents of the Yevsektzia (the "Jewish Section" of the Communist party) and the GPU (forerunner of the KGB) because of his work to preserve Judaism throughout the Soviet Empire. The Rebbe was sentenced to death, for his "counter-revolutionary" activities, but a miraculous confluence of events forced the Soviets to commute it, and then to release him altogether. The full account of the Rebbe's arrest and liberation can be found here. The following is a translation of an excerpt from the Rebbe's diary (written several months before his arrest and printed as an appendix to "The Heroic Struggle"), in which he describes how (on an earlier occasion) he was saved by Divine Providence from the hands of four GPU thugs. 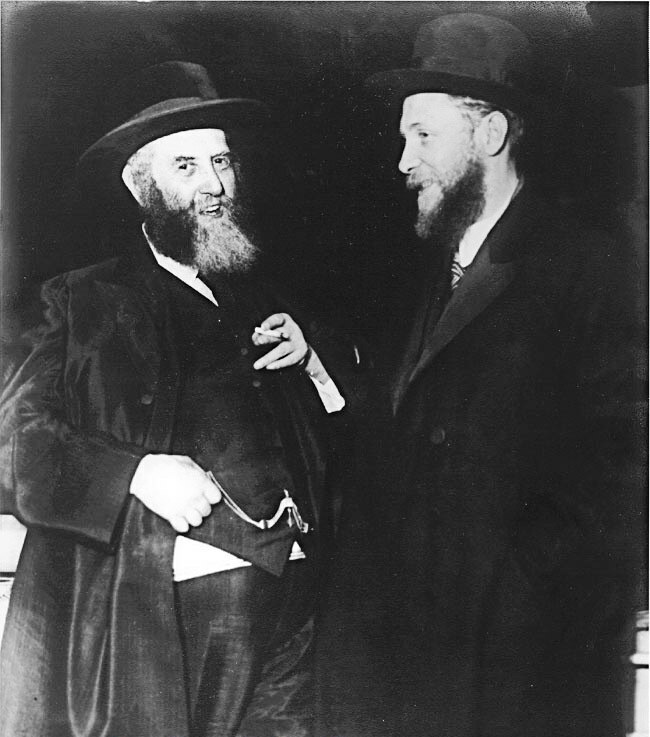 While traveling by train to Moscow, in order to meet with various Rabbis and philanthropists to plan and budget further efforts for the upkeep of Yidishkeit in the face of soviet oppression, the Rebbe happened to meet a high ranking member of the Soviet Secret Police through whom his salvation would be effected mere days later. The following is a letter written by the Lubavitcher Rebbe on the 3rd of Tammuz 5710  within a few months of the Friediker Rebbe's passing. Explanatory editions to the literal translation of the original text are enclosed in square brackets. In the summer of (5543) 1783 the city of Minsk was the stage for a momentous meeting of minds. 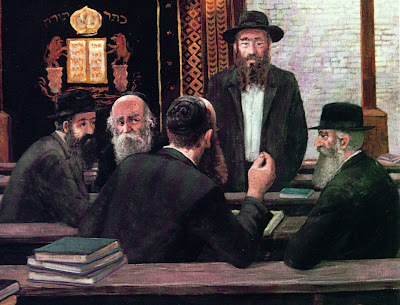 Orchestrated by Rabbi Shneur Zalman of Liadi – the Alter Rebbe and encouraged by the most influential Rabbinic authority of the time, Rabbi Eliyahu, the Vilna Gaon, “the great debate” attracted the greatest and most venerable Talmudic scholars of Lithuania, and was intended to resolve the ongoing conflict between the Chassidim and their opponents (“Misnagdim”). After much deliberation the Goan Rabbi Eliyahu had decided that “if “the cult” [as the Chassidim where referred to] are to demand a debate then we are obligated to answer them”, and so Rabbi Schneur Zalman let it be known that he would be present in the city of Minsk on the Shabbos following the 9th of Av and would remain there for two or three weeks thereafter, so that he may answer “anyone with a query or a complaint against the Chassidim or their conduct”. The Rov of the Chassidic Shtetel of Dokshitz, Reb Leib Sheinin learnt in Yeshivas Toimchei Temimim Lubavitch between the years 5668-5677 (1908-1917). Arriving there at a young age, from his home town of Babroisk, he grew to become one of the most outstanding student’s of the Yeshivah and was famous for the many hours he sent daily in prayer. In the words of Reb Yehudah Chitrik (Reshimos Devorim, in the New Edition P. 302) “the Temimim would often repeat in the name of the Rebbe Rashab that all his [the Rebbe’s] work, his efforts and self-sacrifice, [expended] in order to found Yeshivas Toimchei Temimim – is worth it in order to produce such a Talmid as Reb Leib Sheinin”. In the version recorded in Lubavitch Ve’chai’oleho, he added “all the rest are extra gain”. He was famed as an ‘Oivied’ [one who serves G-d, through lengthy prayer and contemplation] and it was said of him that he reached the level of Beinoni as described in Tanya (Ibid). There has recently been a renewed interest in the Lubavitcher Rebbe’s activities and lifestyle during the period that he spent in Berlin and Paris between the years 1927-1940. I will not dispute the assertion that, though “there is no question he was an observant Jew... he lived in places where Chasidim didn’t live, and he did things they wouldn’t do.” Another point that I won’t dispute is that the Rebbe may never have thought of himself as a candidate for the position of Rebbe. However, if this is to lend credence to the author’s claim that the Rebbe veered away from the path of his forbearers and father-in-law and essentially lived the life of a modern orthodox Jew rather than that of a Chassidic Jew, the authors must have ignored a large swath of readily available information, which conclusively proves this thesis to be incorrect. While no one will argue that the Rebbe dressed like a Chossid during his years in Berlin and Paris, there is no doubt that he remained a Chossid in every sense of the word and was absolutely committed to the service of his revered father-in-law, the Previous Lubavitcher Rebbe, as we will demonstrate. The Alter Rebbe usually said two Maamorim (presumably one on each night) each year. However, there were occasions when he said three or four, and we actually have five Maamorim which were all said in the year 5564 (1804). In the year 5607 (1847) many Chassidim came to spend Shavuos [with the Tzemach Tzedek] amongst them the most famous, Reb Hillel Paritcher and Reb Betzalel Mai’azaritz, as well as many others. After coming from the Mikveh on Eruv Shavuos, the Rebbe said a Maamer beginning “Anoichi Havyeh Eloikechoh” [“I am Heshem your G-d” the first of the Ten Commandments]. The son’s of the Rebbe spent the entire evening and night, each in his own house, reviewing the Maamer [before the guests] and before dawn Reb Bezalel repeated the entire Maamer from memory. The following is a continuation of an abridged excerpt from the diary of the Freidike Rebbe dated Sunday, 2o Iyar, 5656. For part 1 see here. Text enclosed in square parentheses has been added either by the Translator or myself. I have also changed the order in which some of the stories are recorded. After [the morning] davenen, when most of the worshipers had gone home and only a few remained, three elder chassidim sat together in the room adjoining the zal and exchanged narratives -- my teacher R. Shmuel Betzalel, R. Abba Persohn, and R. Shmuel Gurevitch. [Reb Avrohom Abba Persohn’s father was a Chossid of the Mitteler Rebbe and later the Tzemach Tzedek, as well as being a respected Chossid, he was also one of the most respected philanthropists in the region. He had his son, Avrohom Abba, educated by Chassidim of the old-school. Translators note: the following story describes events that took place in spiritual realms, belonging to a dimension beyond human conception or description. Not having the words to describe such sublimity we must resort to a description, which does not do justice and is to a great extent incongruent, with the true nature of the spiritual realms described. Due to a certain matter which the Rebbe Rashab achieved, his father, the Rebbe Maharash, took him into the supernal realms, till a particular place to which the Rebbe Rashab was able to accompany the rebbe Maharash. From there the Rebbe Maharash continued on by himself. In the meantime, the Rebbe Rashab noticed a chamber where a particularly brilliant Divine revelation was manifest. There sat a Jew who relative to his level of Divine service, apparently did not belong in such a lofty realm. The lesson from this story [explained the Rebbe Zatza”l] is that even an individual who is lacking in understanding and intellectual assimilation, nevertheless merits a great revelation. However, in order not to sit in that lofty realm with “closed eyes” seeing without comprehending, hearing and not understanding that which one hears – one must study and understand with comprehension and intellectual assimilation. Then one will be in a situation of open eyes and ears [having a proper appreciation for the exalted and wondrous revelation]. May these words provide some measure of comfort as we mourn the untimely loss of HaTomim Nosson Notte ben Reb Zalman Yuda A”H Dietsch. A bochur who I knew personally. He knew the fifty-three perokim of Tanya and Igeres HaTeshuvah by heart, word-by-word. He had a heart of Gold and was always smiling. In his presence everyone was comfortable, everyone was smiling. The void he leaves behind him will never be filled. The following is an abridged excerpt from the diary of the Freidike Rebbe, printed in Likkutai Dibburim Vol, 4 as translated by Rabbi Touger (available here). Text enclosed in square prentices has been added either by the Translator or myself. I have also changed the order in which some of the stories are recorded. On Friday evening, though it was almost eleven when we began the Shabbos meal, there was no haste, and it continued until 1:30 a.m. In honor of the distinguished guest, R. Abba Persohn, my former teacher R. Nissan Skoblo, who loved hearing chassidic traditions firsthand, joined the company at the table. R. Shmuel Horovitz recalled that among the elder chassidim of Denenburg and Griva there was a elderly scholar known as R. Abba'le David Iskasya. In the study of nigleh he was the longtime colleague of the learned R. Baruch Mordechai [son in law of the last Rov of Vilna, Reb Shmuel a fuller account of Reb Boruch Mordechai’s history will be provided in a future post] when the latter was still in Vilna, and in Chassidus he was his disciple. “R. Abba David, who was born in Polotzk, was gifted and assiduous, and advanced from one yeshivah to the next until he found his way to the yeshivah of the Gaon of Vilna, where he shone as an outstanding student. 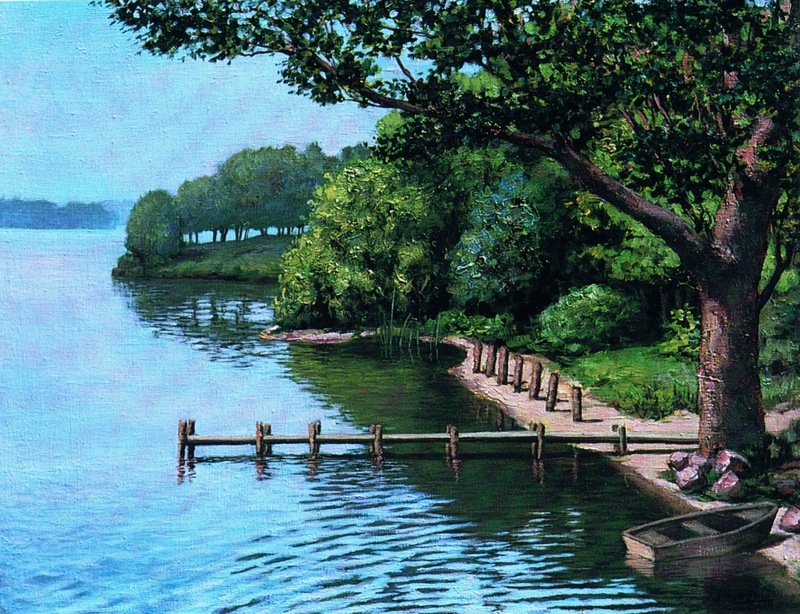 By nature he leaned towards solitude and intensive study. For some days he lived in the shul in a suburb called Shnipishak, and then moved into the center of town. Throughout all that time not one idle word escaped his lips; he knew of nothing but conscientious study; and he made the acquaintance of no man. "When he was about eighty years old he came to live near his son, R. Zerach, the moreh tzedek of Griva, who rented him an apartment near the shul. He spent most of his days and nights studying in the shul, and sometimes slept there. "A chassid by the name of R. Zalman Moshe Leitzener, who for many years had known R. Abba'le David from the time he had been in Vitebsk and in a village near Nevel, and who had also met him on many occasions in Lubavitch, was amazed that he had changed his conduct -- far from being a silent recluse, he was now companionable and a ready talker." "From the first year that the past [i.e., the Mitteler] Rebbe settled in Lubavitch, in 5574 (1813), he renewed the old custom of celebrating Lag BaOmer in the fields out of town. Every year there would be a light festive meal that included mashke and hard-boiled eggs, and there was singing and dancing. In the middle of the meal or at the end the Rebbe [the Tzemach Tzedek] would arrive and deliver a maamar of Chassidus, and would then urge the elder chassidim to tell him whatever they remembered of Lag BaOmer celebrations [with his predecessors] in bygone years -- customs, teachings, narratives. After he left, the chassidim would continue to celebrate together at the table until early evening. Later this celebration became a full festive meal. "From the beginning of the month of Iyar the Rebbe had again permitted his chassidim to visit Lubavitch, after having forbidden them to do so throughout the winter because of all the tribulations that had lasted from the beginning of MarCheshvan until close to Pesach. 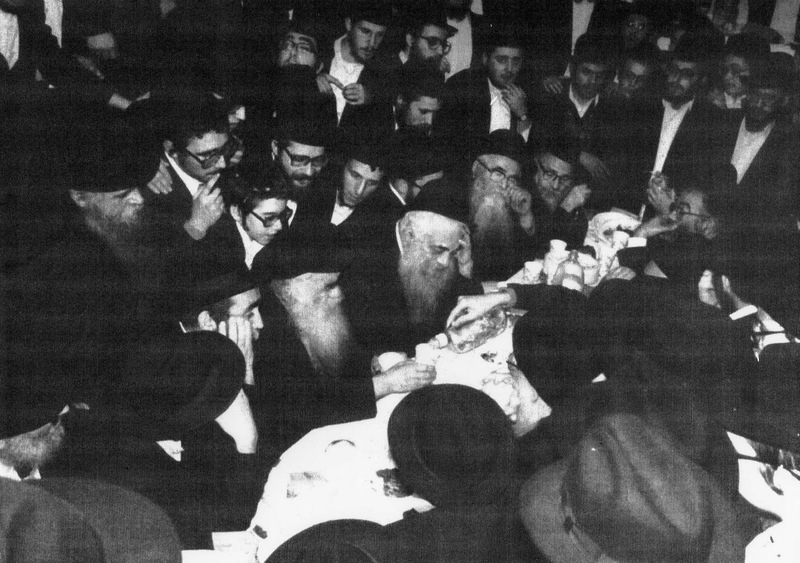 "On Shabbos HaGadol, after a break that had lasted all winter, the Rebbe delivered a maamar of Chassidus (beginning with the phrase, Zos Toras HaOlah) in public. All the townsfolk [of Lubavitch] were overjoyed, and especially the yoshvim. Emissaries gave out the word that the Rebbe had again allowed chassidim to visit Lubavitch. Many already arrived in time for the first Shabbos after Pesach, Parshas Tazria-Metzora. As the news spread their numbers increased, so that for Shabbos Parshas Emor and Lag BaOmer which followed it there were about four hundred visitors, the most prominent among them being the distinguished R. Aizik of Homil and R. Hillel of Paritch. "On that Shabbos Parshas Emor the Rebbe delivered three maamarim. The first, Ein Omdin LeHispalel Ela MiToch Koved Rosh, was delivered after Shacharis on Friday; the second, LeHavin Inyan Koved Rosh BaAvodah BeNefesh HaAdam, was delivered before Kabbalas Shabbos; and the third, LeHavin BeTosefes Biur: Yisrael -- Li Rosh, on Shabbos before Minchah. "The joy of that year's Lag BaOmer celebration was doubled and trebled [beyond that of a regular year, due to the renewed opportunity to see the Rebbe and hear Chassidus from him]. "Since the third fast [of the Behab series of fasts] fell on Monday, the eve of Lag BaOmer, three celebrated rabbis -- R. Nechemiah of Dubrovna, R. Aizik of Vitebsk, and R. Aizik of Homil -- convened a beis din, and ruled that on this particular occasion, in view of the imminent communal celebration, those present should not complete the fast. Instead, after an early Minchah, they were to observe their well-established custom and participate in the annual festive meal. "At the farbrengen that then took place, R. Yitzchak Aizik of Homil rebuked R. Hillel of Paritch for his numerous hiddurim and for his excessive vigilance. A basic principle in avodah, he argued, is that one should follow the middle path. As the medieval thinkers conclude, superiority is not to be sought in either extremity, even in the higher; true happiness lies only in the middle path. "[In response to R. Aizik of Homil's rebuke], R. Hillel of Paritch sought to explain that he had not been prompted by conceit or arrogance. 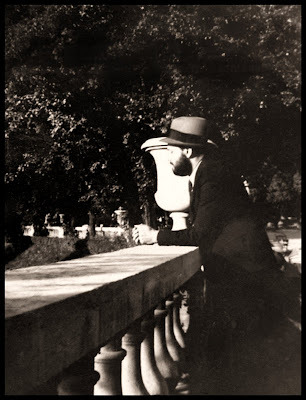 Weeping as he spoke, he recounted the story of his life until he first came to meet his mentor, the saintly R. Mordechai of Chernobyl, and then the events through which he eventually found his place under the wings of Chabad Chassidus and its teachings. “In 5571 (1811) the Alter Rebbe journeyed to Vohlyn, and on his way back through the Mozir region thousands of people gathered together to hear him at every town and village. At one of the inns on the way, some five hundred people awaited him. Among them was R. Hillel, and from the lips of the Alter Rebbe he heard the discourse beginning, leolam yargiz adam yeitzer tov al yeitzer hora. "Reb Hillel related, “one of the venerable chassidim who accompanied the [Alter] Rebbe on that journey [in 1811], my distinguished mentor, R. Zalman Zezmer, clarified for me both the principles and the details of the above discourse. "For three years the teaching that I then heard from the [Alter] Rebbe stirred me from within, and in Elul of the year 5575 (1815) I visited the [Mitteler] Rebbe in Lubavitch. For three years I toiled to refine my body and all my organs so that they should attain the level of being truly good, and not only right. First of all, avodah can be considered proper only when the body is good, and not merely in the right by virtue of various excuses. Besides, when one departs this world and arrives at the World of Truth, time is precious: it's a pity to waste it on judicial proceedings involving trivial matters." The big clock at the south wall chimes 1:30 a.m., but R. Yosef the Meshares says that it is slow; he prefers to believe the rooster that crowed an hour ago. He is right: any minute now the morning star will rise, so we say the Grace After Meals. The morning star rose as we left my grandmother's home, and the air was fresh. For over an hour we stood around and sat around in the courtyard, repeating the talks and the narratives that we had heard at the table. Then they all went off -- apart from R. Abba Persohn -- to immerse in the mikveh, and I went to sleep. This is a continuation of the memoirs of Reb Shmaryahu Sussonkin, translated and abridged from the original Hebrew version published as “זכרונותי”. On the day before Sukkes 5662 (1901) I reached the age of Bar Mitzvah. In those days they did not make a celebration on the day of the Bar Mitzvah, they simply called me to the Torah, my father made the Brochah, “Boruch Shepotarani”, and recited the verse “behold I have given before you the life and the good… and you shall choose life”. I promised him that I would study in a Yeshivah, for I choose life and good, and there is no good aside from Torah. Directly after the festivel I traveled [to Yeshivah] together with a few other youngsters who had already learnt in [the Yeshivah in] Amtzislav, during the previous semester. When I arrived in Amtzislav it became known to me that the founder of the Yeshivah is the scholarly genius Reb Elchonon Vasserman. He was the examiner and decision maker as to whether or not to accept students. He opened up a Mesechtes Kesubes before me, pointed to a particular Toisfes and instructed me to study it and explain what was difficult in it [i.e. Reb Elchonon instructed him to uncover a difficulty with the explanation provided therein]. I easily found the difficulty. He then pointed to another Toisfes and said, “study it and find an answer to the question”. I easily worked out how the second Toisfes resolves the first and with that the test was completed. Reb Elchonon was a distinguished personality and his face seemed to shine with wisdom. Apart from being a genius in learning, his wonderful genius and expertise was also reflected in the way he taught, such that I have never seen his like. He was also a very practical person. It was enough to hear his Shuir for the duration of one semester, in that short time he already enlightened your eyes and gave you a solid foundation in the study of the Talmud. In general, Harav Vasserman ran the Yeshivah at a high level. While delivering his Shuir he knew how to provoke the students, ensuring that they would pay attention and listen well. It was his custom to expound the Gemoroh before the students with excellent explanation. He addressed only the unadorned rationalization of the Gemoroh, together with the commentary of Rashi, explaining with good reasoning the connotation of the cryptic text, with such lucidity that even a child could understand. So excellent and pleasant was his initial elaboration that the questions of Tosfos on the explanation of Rashi where automatically resolved. It was his custom to pay close attention to how well the students listened to the Shuir; who listened intently, who without much intent and who didn’t listen at all. On concluding, he would turn to a student and require him to repeat the entire Shuir by heart, directing him to close the Gemoroh. Being that the chosen student had not been listening, he by default would not be able to go over what had been said. Reb Elchonon would let the first student be, directing another, who had been listening without concentration, to repeat the Shuir. Since the second student had been listening somewhat, he would be able to go over some of the Shuir, but would become confused and stammer as he repeated it. Reb Elchonon would help him out, clarifying his confusions until he had repeated the entire Shuir. Then he would again turn to the first, who had earlier been unable to go over the Shuir. If on this occasion he had listened and knew it well, all would be well; if not Reb Elchonon would rebuke him, saying that he is a student who does not want to listen, who turns his ears away from words of Torah. If on a third occasion that student did not know the Shuir well enough to repeat it by heart, Reb Elchonon would expel him from the Yeshivah. In this way he entirely uprooted the problem of students not paying proper attention to the Shuir, although it began through fear, subsequently all the students would become accustomed to concentrating well as he delivered his Shuir. His method of teaching Toisfos was a follows: a student would read and explain the Toisfes, and when he arrived at a passage that required elucidation or clarification, Reb Elchonon would interrupt the student, and proceed to elucidate and clarify the concepts until they were illuminated and exceptionally lucid. He was keen to only address the unembellished explanation of the Gemoroh and the Toisfes, and he did not at all like the method of Pilpul. Once we had finished learning a particular subject, sometimes covering seven folios of the Talmud or more, Reb Elchonon would announce that during the next two days there would not be a Shuir and that the students should spend the time reviewing the Gemoroh thoroughly. By the time the review was complete, on the third day, he would have a list of the all the students divided into small groups, classified according to their levels of ability and knowledge. Sometimes there were three students in a group, sometimes five or more. Each group would enter separately and ask them different questions, if they where fluent in the Gemoroh and the Toisfes that they had learnt they would be able to answer his questions with ease. Since the students realized that everything was dependent on fluency, they would compete to review what they learnt very well. Although with this method of study we were only able to learn a smaller amount relative to other Yeshivas, nevertheless, we knew the folios that we learnt well and they were fluent in our mouths. The concepts were completely clear to you and you would be asked something you would not be confused from answering correctly. For a full year I learnt in the Yeshivah with diligence, and Reb Elchonon would guard the student like the apple of his eye. If a student G-d forbid became ill, he himself would take care of him, take him to the hospital and arrange devoted care. Once he traveled to one of the big cities and brought cloth for winter clothing for all the students of the Yeshivah. During the third semester, the final summer during which Reb Elchonon remained in the Yeshivah, an unpleasant event occurred. During that period there where already a number of trouble-makers who attempted to convinced the Yeshivah students to learn secular studies. Unfortunately, they managed to draw some ten students after them who agreed to learn secular subjects; nevertheless, they also wanted to continue to hear Reb Elchonon’s Shuir. As soon as they arrived, however, Reb Elchonon sent them outside. In order to prevent an outrage from arising the Shuir was said behind closed doors throughout the next two weeks, until they gave up hope of being allowed to attend. Reb Elchonon announced that the Yeshivah would not tolerate secular studies and anyone who wishes to study secular subjects should leave the Yeshivah! Indeed, all the students agreed with Reb Elchonon’s statements. However the devil’s work succeeded, for the trouble-makers found support among the laymen of the town who put pressure on the Rabbi of the City to take the students of the Yeshivah under his control and supervision. Then they telegrammed Reb Elchonon – who had traveled away to spend the festivals with his family – that he should remain at home and that hereafter the Rabbi would fill his old position. The Yeshivah continued to exist for only one more semester, after which it was closed down. When Reb Elchonon’s students heard that their teacher would not be returning, there was no reason for them to remain in the Yeshivah and they departed some to Telz, some to Slutzk, some to Velozhin and some to Radin. I went to Kremenchug. Another memoir describing Reb Elchonon הי"ד is available here. 1) This blog is devoted to the exploration and explanation of Chabad thought and attitudes in the light of the rich history of Chabad Chasidus and Chasidim. 2) Questions and comments may be emailed to chabadrevisited [at] gmail [dot] com or using the "comments" form below each post. 3) To receive notification of new posts by email, please enter your details in the "subscribe" form above. This work by Chabad-Revisited is licensed under a Creative Commons Attribution-Noncommercial-No Derivative Works 3.0 United States License.